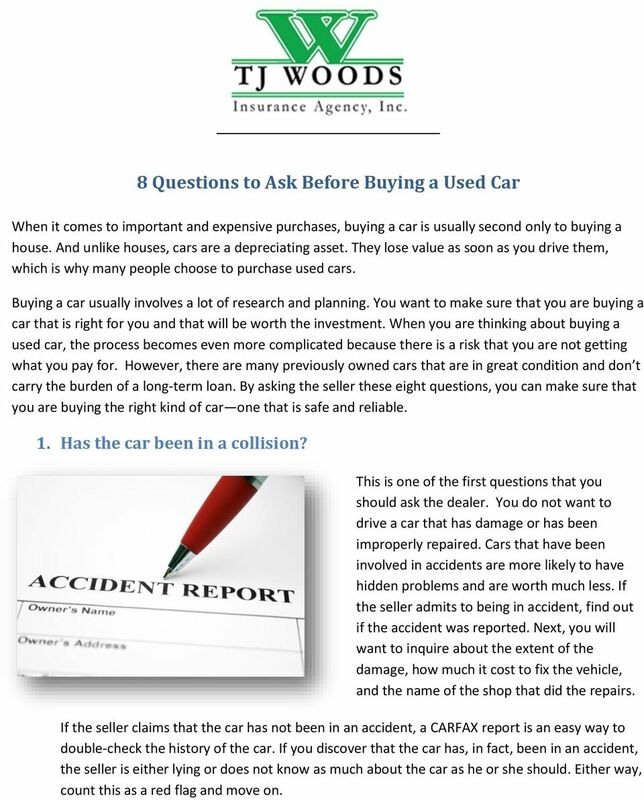 Download "8 Questions to Ask Before Buying a Used Car"
1 8 Questions to Ask Before Buying a Used Car When it comes to important and expensive purchases, buying a car is usually second only to buying a house. And unlike houses, cars are a depreciating asset. They lose value as soon as you drive them, which is why many people choose to purchase used cars. Buying a car usually involves a lot of research and planning. You want to make sure that you are buying a car that is right for you and that will be worth the investment. When you are thinking about buying a used car, the process becomes even more complicated because there is a risk that you are not getting what you pay for. However, there are many previously owned cars that are in great condition and don t carry the burden of a long-term loan. 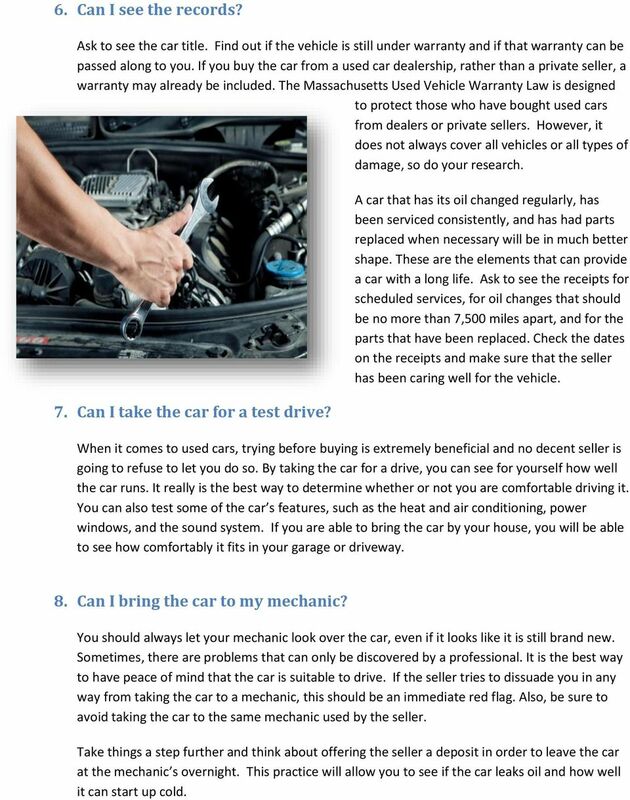 By asking the seller these eight questions, you can make sure that you are buying the right kind of car one that is safe and reliable. 1. Has the car been in a collision? This is one of the first questions that you should ask the dealer. You do not want to drive a car that has damage or has been improperly repaired. Cars that have been involved in accidents are more likely to have hidden problems and are worth much less. If the seller admits to being in accident, find out if the accident was reported. Next, you will want to inquire about the extent of the damage, how much it cost to fix the vehicle, and the name of the shop that did the repairs. If the seller claims that the car has not been in an accident, a CARFAX report is an easy way to double-check the history of the car. If you discover that the car has, in fact, been in an accident, the seller is either lying or does not know as much about the car as he or she should. Either way, count this as a red flag and move on. 2 2. Why are you selling the car? Trust your intuition when it comes to the response to this question. If the owner s reason for selling the car seems off or feels strange, you might want to take your business elsewhere. I m moving, or I just got a new car, are typically good answers to this question because it means that he or she is looking to sell quickly and has a valid reason (other than the car itself) to sell. If the seller is strapped for cash, he or she may sell the car for a lower price if you pay in cash up front. 3. Are you the first person to own this car? You want to be able to learn as much about the car s history as possible. Cars with only one previous owner are ideal. If the vehicle has been owned by many people, uncovering some of its finer details could prove to be difficult. The more you know about the car, the easier it will be to decide if it is the right choice for you. Be wary of cars that have had multiple owners in a relatively short span of time. 4. Are you the car s principle driver? If possible, you will want to meet with the person who drives the car most often. A middle aged man might be selling the car that his teenage children drive. Or it could be his elderly parents car. Learning who mainly drives the car can give you an idea about how well the car has been treated. Purchasing a car from an elderly person is ideal, because chances are, they haven t put many miles or a lot of wear and tear on the vehicle. 5. How many miles does the car have on it? The mileage will affect the car s worth. Research how many miles this make and model of car typically lasts before you meet with the seller. This way, you can determine if the price that he or she offers is reasonable. When you see the car, make sure that the miles on the odometer match what the seller told you. While low millage is ultimately desirable, it should not be the ultimate factor. Find out where and for what purpose the car is typically driven. Vehicles that are used for long commutes to work are preferable to cars that are being used for stop-and-go deliveries. A car that is most often driven on the highway is not going to be as worn down as a car with the same millage that is mainly driven in the city. 3 6. Can I see the records? Ask to see the car title. Find out if the vehicle is still under warranty and if that warranty can be passed along to you. If you buy the car from a used car dealership, rather than a private seller, a warranty may already be included. 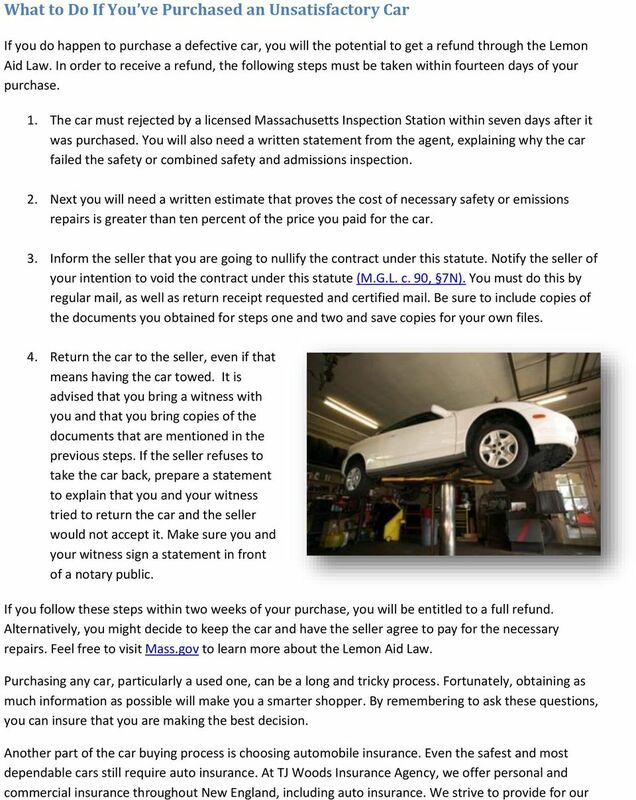 The Massachusetts Used Vehicle Warranty Law is designed to protect those who have bought used cars from dealers or private sellers. However, it does not always cover all vehicles or all types of damage, so do your research. 7. Can I take the car for a test drive? A car that has its oil changed regularly, has been serviced consistently, and has had parts replaced when necessary will be in much better shape. These are the elements that can provide a car with a long life. Ask to see the receipts for scheduled services, for oil changes that should be no more than 7,500 miles apart, and for the parts that have been replaced. Check the dates on the receipts and make sure that the seller has been caring well for the vehicle. When it comes to used cars, trying before buying is extremely beneficial and no decent seller is going to refuse to let you do so. By taking the car for a drive, you can see for yourself how well the car runs. It really is the best way to determine whether or not you are comfortable driving it. You can also test some of the car s features, such as the heat and air conditioning, power windows, and the sound system. If you are able to bring the car by your house, you will be able to see how comfortably it fits in your garage or driveway. 8. Can I bring the car to my mechanic? You should always let your mechanic look over the car, even if it looks like it is still brand new. Sometimes, there are problems that can only be discovered by a professional. It is the best way to have peace of mind that the car is suitable to drive. If the seller tries to dissuade you in any way from taking the car to a mechanic, this should be an immediate red flag. Also, be sure to avoid taking the car to the same mechanic used by the seller. Take things a step further and think about offering the seller a deposit in order to leave the car at the mechanic s overnight. This practice will allow you to see if the car leaks oil and how well it can start up cold. 5 customers and keep their best interests at heart. Feel free to contact us for a free quote on auto insurance today. TJ Woods Insurance Agency is located at 20 Park Avenue in Worcester, MA. We offer personal and commercial insurance coverage to Massachusetts residents and businesses as well as financial services throughout New England. 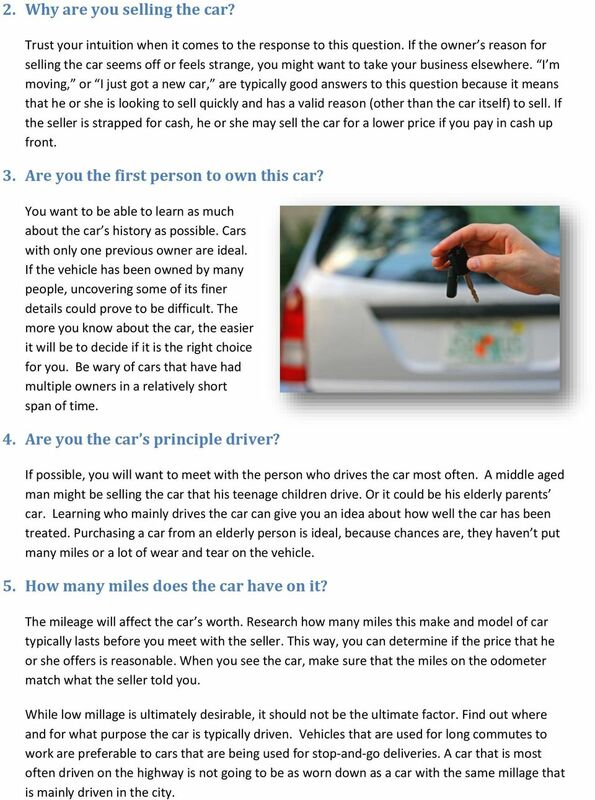 The used car buyer s guide by Jason Dawe. CAR PROJECT Name: *Be sure to include all calculations! Use binder paper if you need more space! * Part 1: Costs associated with owning a vehicle 1) Look at Canadian websites of different car dealerships. Buying a Car. Choosing the car you want/need. Which is it? How do you see your car? Best Practices in Used Car Lending: Michigan Credit Union League Presented by Rory Rowland Learn: Best Practices in Used Car Lending Who are the best used car lenders? What are their secrets of success?